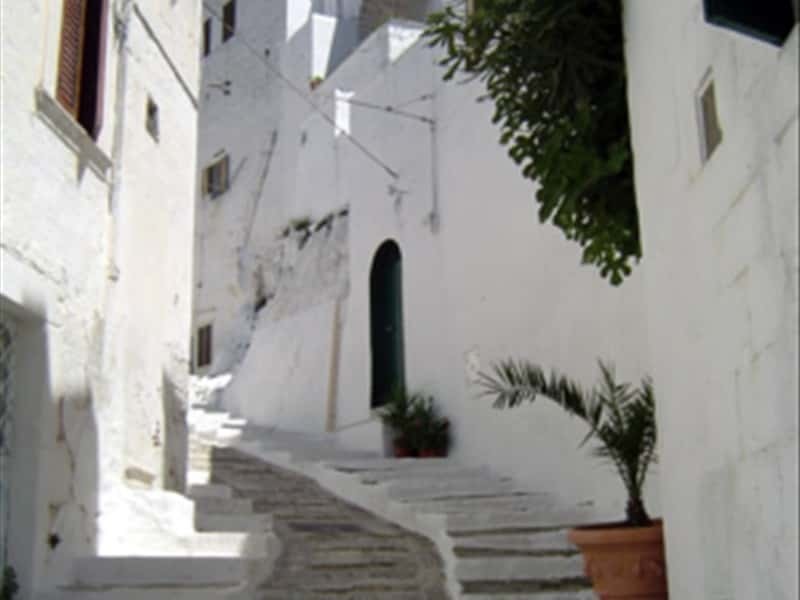 Ostuni is known as the "White City" because its old centre features buildings all coloured with lime paint. This practise, in use since the Middle Ages, reflects the need to give light to the streets and alleys and is typical of ancient cities. The city is situated on the last corner of the southern Murgia, between three hills at a height of 218 m above sea level. It lies on the border between the province of Brindisi and Taranto, to which it belongs geographically and is one of the first outposts of Salento. Ostuni is only 8 km from the coastline of the Adriatic Sea and among the seaside districts, worth a visit: Rosa Marina and Villanova. Ostuni has never betrayed its agricultural vocation with the production of olive oil DOP, wine and almonds and the related industrial processing. However, since the last World War, tourism has become one of the major resources of the local economy. Ostuni proposes sites of cultural, historical and architectural importance, a crystal clean sea and beautiful ancient fortified farmhouses ("masserie"), where it is possible to stay and take advantage of the quality of agricultural products and the local gourmet cuisine. These farmhouses, with their estates, have recently attracted interest from abroad. The territory of Ostuni was inhabited since Prehistoric Ages, proved by Anthropogenic traces. In the " Pre-Classical Civilization Museum of Southern Murgia " it is possible to admire the skeleton of a woman dating back 25 000 years ago. It was given the name "Delia" and was found with her skull completely covered with hundreds small shells. Ostuni was founded by the Messapi (an antique Italic population) and at the times of the Romans it was submitted to the Empire. Under the Norman rule, the cultivation of the 'olive trees was intensified and with the Aragons, the city reached its most flourishing period in which the most vigorous population growth was recorded. In the old city, there are still visible long stretches of the Aragon walls, reinforced by circular towers. Not to miss: the Baroque Palazzo Ducale Zevallos and the Cathedral, dated 1435, features a late Gothic façade. This town web page has been visited 45,074 times.